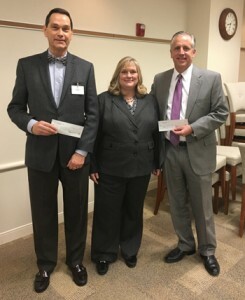 Christian Hospital President Ron McMullen and SSM DePaul President Sean Hogan receive Mallinckrodt grant funding for their CHAP programs from NCI President Rebecca Zoll. ST. LOUIS (Jan. 11, 2016) – North County Incorporated (NCI) is proud to announce today the receipt of a $100,000 grant from Mallinckrodt Pharmaceuticals to help fund the Community Health Access Program (CHAP) for Christian Hospital and SSM Health DePaul Hospital, two important hospitals serving patients in North St. Louis County. Under the program, the hospitals coordinate efforts of their Emergency Medical Services (EMS) resources and Emergency Departments (EDs) to help assure low-income, non-emergent patients – many of whom contact 911 for EMS in times of need – receive the right care from the right resource, at the right time. The hospitals identify patients for CHAP services based on calls to 911 and visits to the hospital EDs for non-urgent issues or medical conditions that do not require immediate medical attention. Currently, CHAP provides Advanced Practice Paramedic services and referrals to Christian Hospital’s Community Health Resource Center for comprehensive evaluation and connections to appropriate resources for non-urgent patients, ultimately assuring that individuals are able to access the outpatient and preventive services they need. Since its inception, CHAP at Christian Hospital has positively impacted more than 10,000 people. The grant will help Christian Hospital expand CHAP to ensure more patients receive access to care in the most appropriate setting. “We are thankful that Mallinckrodt recognizes our approach to provide measureable and positive outcomes in low-income populations and is willing to help us refine the program and broaden its access so that more patients can benefit,” said Ron McMullen, president of Christian Hospital. For SSM Health DePaul Hospital, this grant will enable the hospital to work with community ambulance services to develop a model to test the effectiveness of CHAP in its service area. St. Louis County Executive Steve Stenger commended Mallinckrodt for its contribution. Mallinckrodt is a global specialty biopharmaceutical and imaging business that develops, manufactures, markets and distributes specialty pharmaceutical products and therapies and imaging agents. Areas of focus include therapeutic drugs for autoimmune and rare disease specialty areas like neurology, rheumatology, nephrology and pulmonology; immunotherapy and neonatal respiratory critical care therapies; and analgesics and central nervous system drugs. The company’s core strengths include the acquisition and management of highly regulated raw materials; deep regulatory expertise; and specialized chemistry, formulation and manufacturing capabilities.